Speed climbing dates back to the origins of competitive climbing in 1940’s Soviet Russia where the time it took to complete long and difficult routes was a key scoring metric. Competing head-to-head was a common practice among Soviet climbers and introduced to the world in 1976 with the first international climbing competition held in the Russian city of Gagra. Modern speed climbing is a side-by-side battle for the fastest time on the fifteen meter wall. Dead flat and overhanging five degrees, the speed wall is a purpose built vertical track with two identical routes that never change. Unlike bouldering and lead where climbers must quickly analyze and adapt to the problems and routes set specifically for each round, speed climbers can spend years mastering the muscle memory and discipline that can shaves fractions of a second from their time. The world’s fastest speed athletes ascend fifteen meters between 7.32 and 5.48 seconds. Speed climbing is an intense burst of athletic energy that for the uninitiated, masks how difficult it really is. Speed times are recorded to 0.01 second using pressure plate foot triggers to start the clock and light sensors to stop. In this discipline, fastest to the top wins and a single false starts knocks a climber out of the race. 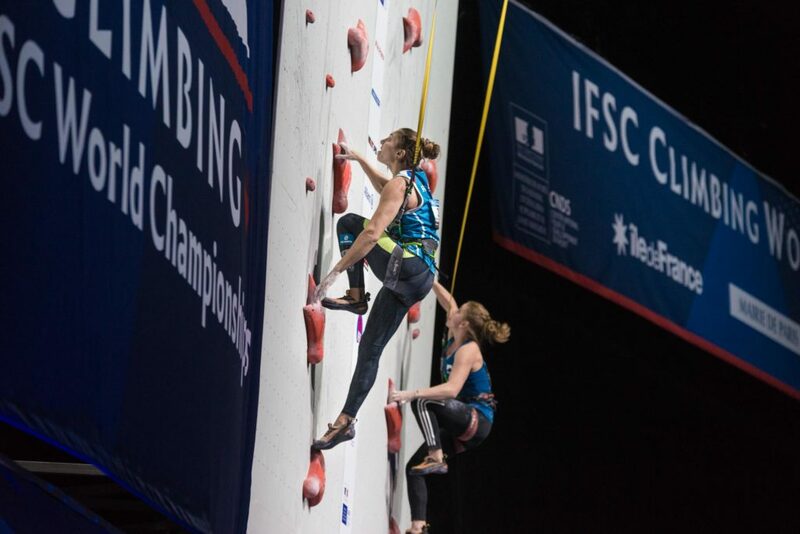 In 2016, the IFSC awarded Perfect Descent the exclusive license to supply auto belays for world record speed events and their distinct yellow lanyard has become a familiar site at gyms and competitions around the world. The modern era of sport climbing was born in 1985 when top climbers gathered at a natural crag in the Valle Stretta near Bardonechia, Italy for SportRoccia. Thousands of spectators cheered the climbers who followed marked routes through the natural terrain. The challenges and impact of running a competition on a natural crag pushed the event to artificial walls by the late 1980’s when SportRoccia became a stage on the newly formed Climbing World Cup. The first World Championship was organized in 1991 and the following year a large field of competitors turned out for the first Youth World Championships in Basel, Switzerland in a clear sign of the growing popularity of the sport. By the end of the 1990’s, bouldering was officially introduced and together with lead and speed disciplines resulted in the creation of the World Cup. Sport climbing continued to grow throughout the 2000’s with milestones including the inclusion in the World Games and Indoor Asian Games, the introduction of International Paraclimbing competition, and the founding of the International Federation of Sport Climbing (IFSC). By 2013, sport climbing was on the International Olympic Committee (IOC) shortlist for the 2020 Olympic Games bringing a new level of worldwide exposure and international support. Within two years of sport climbing’s demonstration debut at the 2014 Youth Olympic Games, the IOC officially confirmed its inclusion in the 2020 Tokyo Olympic Games. Climbing walls can be found in more than 140 countries and the popularity of climbing gyms and their size and scale are growing rapidly. Estimates put global participation in climbing sports around thirty-five million and climbing teams (the grass-roots breeding ground for future World Champions and Olympic hopefuls) can be found at most gyms. In the time since the first SportRoccia, climbing has evolved into a modern and professional athletic series that celebrates alpine culture and community with a global audience. Sport climbing competitions are structured around bouldering, lead, and speed disciplines. In bouldering, climbers have a set time frame in which to capture their score with only two holds producing points in this strategic competition. The score is achieved when the climber demonstrates control on the top hold and, or a marked hold mid-route designated as the bonus hold. Officials confirm that control is achieved when the climber touches the top or bonus hold with both hands for three seconds. The number of attempts to reach control is an additional variable making the climber with the most number of controlled tops in the least number of attempts the winner. Bonus scores are only used as top score tie-breakers. Qualification rounds typically feature 5 boulder problems with only four to conquer in semi-final and final rounds. While the objective to gain control of set holds is the goal in both bouldering and lead disciplines, the lead climber has a long and difficult route to victory, if they manage to stay on the wall. Lead climbing is an endurance event where climbers clip a trailing rope into quickdraws for protection as they ascend. There is only one chance in lead climbing with the top score awarded to the competitor who controls the highest hold. Climbers are not isolated in the qualifications and are allowed to watch other competitors before their own attempt. Semi-final and final rounds are to be on-sight and athletes are given a six minute observation period to observe the route before entering isolation. One-by-one, competitors are called form isolation for their attempt in reverse of the ranking order in the previous round. The routes are time limited between six and eight minutes and typically reflects the routes complexity. Ties are broken by the countback process where prior results are counted. If lead competition is a marathon, speed is the 100m dash. The only head-to-head discipline, speed is a side-by-side battle for the fastest time on the fifteen meter wall. Dead flat and overhanging five degrees, the speed wall is a purpose-built vertical track with two identical routes that never change. Unlike bouldering and lead where climbers must quickly analyze and adapt to the set problems and routes, speed climbers can spend years mastering the muscle memory and discipline that can shaves fractions of a second from their time. The world’s fastest speed athletes ascend fifteen meters between 7.32 and 5.48 seconds. Speed climbing is an intense burst of athletic energy that masks for the uninitiated, how difficult it really is. Speed times are recorded to 0.01 second using a pressure plate foot triggers to start the clock and light sensors to stop. In this discipline, fastest to the top wins. In 2016, the IFSC awarded Perfect Descent the exclusive license to supply auto belays for world record speed events and their distinct yellow lanyard has become familiar site at gyms and competitions around the world. As sport climbing continues to evolve and the dream of becoming an Olympic climber moves closer to reality for some, there is skepticism coming from parts of the climbing community about the rapid pace of changes and the increasing attention on the sport. On the heels of the announcement that sport climbing would be included in the 2020 Tokyo Olympic Games, concerns were raised over combined scoring format agreed upon between the IOC and IFSC. Unlike the World Cup circuit where athletes are free to select one or more disciplines to compete in, Olympic climbers will be ranked and medals will be awarded based on the cumulative score from competing in all three disciplines. This will invariably alter the field of athletes who have been at the top of the scorecard on the Youth and World Cup circuit in previous years. No doubt, climbing in the Olympics will forever change the course of the sport just as moving from natural rock to artificial walls in the early years of SportRoccia moved competitive climbing in a direction few would have imagined forty years ago. Faster, higher, stronger, that is the motto of the Olympic games and a vision that competitive sport climbing so strongly fulfills. In the end, the excitement about climbings Olympic debut may be a flash in the pan as there is not guarantee that it will be apart of the games after 2020. That will be up to the masses and whether they find appeal in athleticism and competition embodied by sport climbing and connect with the rich history of alpine pursuits that it represents.